Ongava was founded on bold ideas – land reclamation and rehabilitation, reintroduction of wildlife, and the creation of a partnership for the future that is vital for the health of the planet and our souls. With pressing environmental issues threatening our future, Ongava is once again responding to the needs of the planet and our guests with the creation of Andersson’s at Ongava and the Ongava Research Centre (ORC), the next generation in eco-tourism. Taking a lesson from the wild in the power of symbiotic relationships, Andersson’s at Ongava provides an interactive hub for guests to be a part of conservation science, where cutting edge technology meets hands on, field-based research. Guests at Andersson’s at Ongava have the option of being immersed in and can contribute to developing creative, knowledge driven solutions with resident scientists, visiting researchers, conservationists and rhino security personnel, or simply relaxing and enjoying the luxurious guest suites, waterhole, photographic hide, and pool where they will find their own personal place for reflection. Ensuring a light footprint and an exceptional experience, Andersson’s at Ongava will have seven contemporary designed luxury guest units and one family unit, accommodating a maximum of 18 Guests. With colors, textures and materials that connect guests more closely to the safari experience, the guest suites at Andersson’s at Ongava are designed to inspire. The Andersson’s at Ongava guest suites are designed as a direct extension of the landscape, with a natural stone buttress that draws guests in and engenders a deep sense of place. Using natural elements and luxurious touches, the spacious suites reflect the environment, while offering guests a climate-controlled sanctuary in the bush. Each suite has a private viewing deck with a 180 degree panorama. The generously proportioned suites continue the theme of discovery with décor that lends itself to a naturalist’s home. Scientific tomes, journals and a curated collection of published papers, and a digital archive are available to further pique one’s curiosity. Each guest suite comprises of en-suite facilities with separate toilet, double indoor shower and outdoor shower, double vanity basin, mosquito net, tea and coffee making facilities, hairdryer and electronic safe. During winter, cosy hot water bottles and extra blankets are provided. 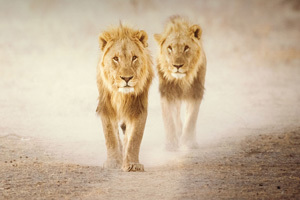 Central to the design of the new Andersson’s at Ongava is the connection to the wild, and it is most keenly felt at the waterhole and nearby underground photographic hide. Here guests have a water level view of the prolific wild and birdlife on Ongava Game Reserve, in a setting that inspires intimacy without intrusion. A centrally positioned infinity-edge swimming pool and surrounding lounge area allows for relaxing in sheltered nooks with views of the waterhole and beyond. The social area, where guests gather for meals and to meet fellow wildlife enthusiasts, guides and naturalists, encompasses an undercover and open-air dining area, a spacious lounge and bar, a sunken observation terrace, and open fireplaces to take away the winter chill. For specialist photographic parties, there is a dedicated photographic nook for review and editing of images. 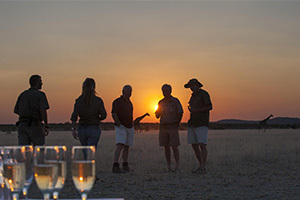 Completing the camp are features such as a uniquely Namibian curio shop, library, complimentary Wi-Fi, and connectivity to the research data developed over years of diligent and cutting edge scientific endeavours on Ongava. A short walk away with the camp’s bounds is the Ongava Research Centre where resident scientists are at home in the lab and within the Game Reserve. Guests to interface with the science and research will primarily take place at the ORC Visitor Centre, where at their leisure, guests are encouraged to meander through the self-guided exhibition area. The adjacent 36-seat auditorium is designed for interactive presentations and discussions. NOTE: Andersson’s Camp will be closed for rebuild from 1 January 2018 to mid-April 2019. Ensuring a high value and exclusive experience, the upmarket Andersson’s at Ongava will have 7 guest units and a family unit. During this closure, the new campus for the Ongava Research Centre will also be established at the Andersson’s at Ongava site. Andersson’s at Ongava is currently undergoing an extensive redevelopment program that is due for completion April 2019. To view an artist’s impression of the exciting new Andersson’s at Ongava Research Centre click here. This camp can accommodate 18 guests plus 4 guide/pilot/tour leaders. En-suite facilities with separate toilet, double indoor shower and outdoor shower, double vanity basin. Private viewing deck with 180 degree panorama, air-conditioning, mosquito net, tea & coffee making facilities, hairdryer, electronic safe and 220V power. Undercover and open-air dining area, a spacious lounge with waterhole views, curio shop, library, infinity edge pool, water level photographic hide, wi-fi service in the lounge, and a dedicated guide and shared game drive vehicle. Bird watching, Game drives, Game viewing, Nature walks, Rhino approaching, Photographic hide, Visit the Ongava Research Centre. All ages of children are welcome. Bookings with children younger than 12 years must book and pay for a private vehicle for entire duration of the stay.